Creating complex visible and invisible systems, as well as discrete objects––often byproducts of her systems––Hayden Dunham investigates the exchange of information between the hard and soft architectures of building and body. 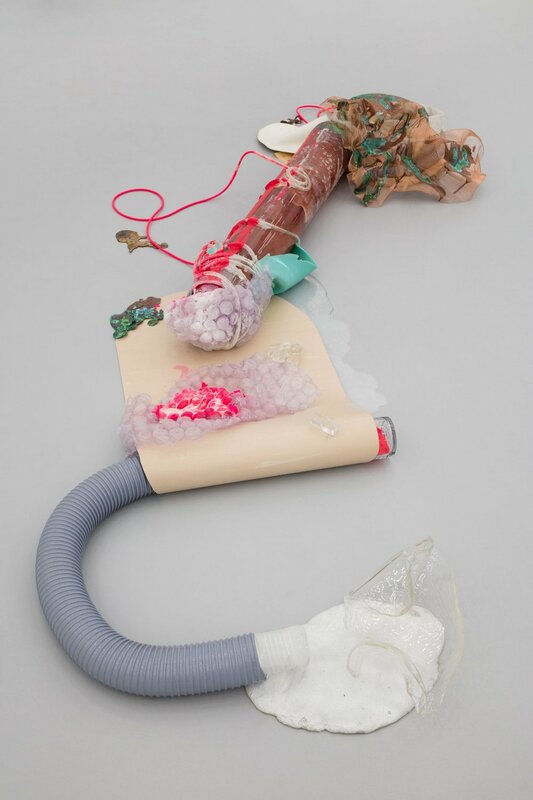 Using silicon, rubber, metal, glass, paints, and minerals as augmentation devices, Dunham’s works embody ideas of transformation and a process of facilitation, where objects are conditioned and supported through their individual internal transformations. Like her manifestations, processes of transformation are also embedded within her parallel creative processes, where conditioning systems enable her own internal conversions and development of identities and domains. Hayden Dunham (b. 1988) currently lives and works in Los Angeles and New York. She has participated in exhibitions and performances at Andrea Rosen Gallery, New York, NY; MoMA PS1, New York, NY; LTD Gallery, Los Angeles, CA; Artist Curated Project, Los Angeles, CA; SIGNAL Gallery, Brooklyn, NY; New Museum, New York, NY; Colette, Paris, France; Irish Museum of Modern Art, Dublin, Ireland.